Brewed in collaboration with the wonderful Verdant, this Double Dry Hopped Double IPA is a rather splendid can of fizzy sherbet fruity fun. There’s a distinct sticky redwood resin through the aroma and right down into the backbone that, coupled with the sweet caramel fondant and honey biscuit of the malting makes for a solid smooth and creamy platform on which the hops can do their thing. And there are a lot of hops in here. Too many to bother mentioning them all, but between them, and pushed along by a delightfully lucky peach flesh from the London Fog yeast, come at you with blasts of lemon curd and lime zest, orange marmalade, gooseberries and green grape skins. It’s all fresh and fizzing with good things as you head towards the gloopy pine wood finish. 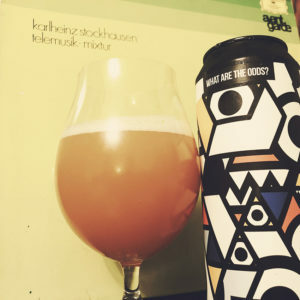 I drank it listening to Stockhausen’s Telemusik as I liberated this particular LP from the Falmouth College of Art music library in the mid nineties, which is when Adam from Verdant and I first met. A whole lifetime before beer – What are the odds? 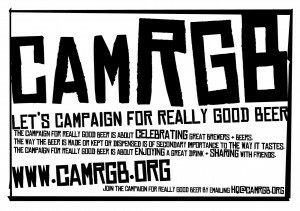 This entry was posted in Beer Review, CAMRGB and tagged Beer, Beer Review, CAMRGB, Can, Canned beer, DIPA, Double IPA, Drinking, IPA. Bookmark the permalink.